Singer-songwriter, Ed Sheeran, was born on February 17, 1991, and raised in Suffolk. In his late teens, Sheeran relocated to London to pursue a music career. His independent EP, No. 5 Collaborations Project led to a recording contract with Asylum Records. By 2012, Sheeran's debut LP + was a big hit in the UK and Sheeran took home 2 Brit Awards. September 12: Sheeran released his debut LP + in the UK. September 18: Sheeran topped the UK LP chart for 3 weeks with +. The LP also topped the charts in Australia, Ireland, and New Zealand. June 12: Sheeran released his debut LP + in the US. September 8: Sheeran hit the ARC Weekly Top 40 with "The A Team." December 15: Sheeran hit the Top 10 with "The A Team." February 10: Sheeran was nominated for a Grammy Award for Song of the Year ("The A Team"). February 27: + was certified gold. March 30: Sheeran hit the ARC Weekly Top 40 with "Lego House." July 27: Sheeran hit the ARC Weekly Top 40 helping out Taylor Swift with "Everything Has Changed." August 25: The video for "Lego House" was nominated for a MTV Video Music Award for Best Male Video. Decemeber 7: Sheeran hit the ARC Weekly Top 40 helping out Lupe Fiasco with "Old School Love." January 26: Sheeran was nominated for a Grammy Award for Best New Artist. April 19: Sheeran hit the ARC Weekly Top 40 with "Sing." April 24: Sheeran performed "Sing" and "Don't" on Saturday Night Live. May 10: Sheeran hit the Top 10 with "Sing." June 14: Sheeran topped the UK singles chart for 1 week with "Sing." June 23: Sheeran released X (to be read as 'multiply'). June 29: Sheeran topped the UK LP chart for 13 weeks with X. The LP also topped the charts in Australia, Canada, Germany, Ireland, and New Zealand. July 12: Sheeran topped the Billboard 200 LP chart for 1 week and Digital Albums chart for 2 weeks (in two different years) with X.
July 26: Sheeran hit the ARC Weekly Top 40 with "Don't." August 14: X was certified gold. August 24: The video for "Sing" won a MTV Video Music Award for Best Male Video. November 8: Sheeran topped the UK Singles chart for 2 weeks with "Thinking Out Loud." December 20: Sheeran hit the ARC Weekly Top 40 with "Thinking Out Loud." December 27: Sheeran hit the ARC Weekly Top 40 helping out Hoodie Allen with "All About It." January 17: Sheeran hit the Top 10 with "Thinking Out Loud." January 26: X was certified platinum. February 8: Sheeran was nominated for 3 Grammy Awards including Album of the Year and Best Pop Vocal Album (X), and Best Song Written for Visual Media (awarded to the songwriter) ("I See Fire"). February 21: Sheeran hit #1 for 4 weeks on the ARC Weekly Top 40 with "Thinking Out Loud." February 21: Sheeran topped the Billboard Adult Pop Songs chart for 6 weeks with "Thinking Out Loud." 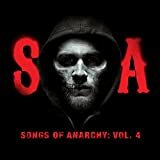 February 24: Sheeran could be heard on the Songs Of Anarchy: Volume 4 compilation with the track "Make It Rain." February 28: Sheeran topped the Billboard Digital Songs chart for 1 week with "Thinking Out Loud." March 21: Sheeran topped the Billboard Pop Songs chart for 1 week and Adult Contemporary chart for 19 weeks with "Thinking Out Loud." April 3: + was certified platinum. May 30: Sheeran hit the ARC Weekly Top 40 with "Photograph." August 8: Sheeran hit the Top 10 with "Photograph." August 29: Sheeran hit the ARC Weekly Top 40 helping out Macklemore & Ryan Lewis with "Growing Up (Sloane's Song)." August 30: The video for "Thinking Out Loud" was nominated for 4 MTV Video Music Awards including Video of the Year, Best Male Video, Best Pop Video, and Best Cinematography. The video for "Don't" was nominated for Best Choreography and Best Editing. September 12: Sheeran topped the Billboard Adult Pop Songs chart for 6 weeks with "Photograph." October 10: Sheeran hit the ARC Weekly Top 40 helping out Rudimental with "Lay It All On Me." November 13: Sheeran released the CD/DVD X Wembley Edition. November 22: Sheeran won an American Music Award for Favorite Pop/Rock Male Artist, and was nominated for Favorite Pop/Rock Album (X), Single of the Year ("Thinking Out Loud"), Favorite Adult Contemporary Artist, and Artist of the Year. December 17: X was certified 2x platinum. December 31: Sheeran topped the Billboard 2015 Year-End Chart Toppers as the Top Pop Artist - Male, and with the Top Adult Contemporary Song ("Thinking Out Loud"). February 15: Sheeran won 2 Grammy Awards including Song of the Year (awarded to the songwriter) and Best Pop Solo Performance ("Thinking Out Loud"), and was nominated for Record of the Year ("Thinking Out Loud"). June 17: X was certified 4x platinum. June 20: + was certified 2x platinum. January 19: Sheeran hit topped the UK singles chart for 14 weeks with "Shape Of You." January 14: Sheeran hit the ARC Weekly Top 40 with "Shape Of You." January 21: Sheeran hit the ARC Weekly Top 40 with "Castle On The Hill." January 21: Sheeran topped the Billboard Hot 100 chart for 13 weeks and Digital Songs chart for 10 weeks with "Shape Of You." January 28: Sheeran hit the Top 10 with "Shape Of You." February 11: Sheeran performed "Shape Of You" and "Castle On The Hill" on Saturday Night Live. February 18: Sheeran hit #1 for 10 weeks on the ARC Weekly Top 40 with "Shape Of You." February 25: Sheeran topped the Billboard Radio Songs chart for 12 weeks with "Shape Of You." March 3: Sheeran released ÷ (Divide). March 4: Sheeran topped the Billboard Pop Songs chart for 9 weeks and Dance/Mix Show Airplay chart for 7 weeks with "Shape Of You." March 10: Sheeran topped the UK LP chart for 17 with ÷ (Divide). March 16: Sheeran dominated the UK singles chart holding the top 6 songs on the chart, having 14 of the top 15 songs, and having 16 of the top 19 songs on the chart. March 18: Sheeran topped the Billboard Dance Club Play Songs chart for 2 weeks and Adult Pop Songs chart for 11 weeks with "Shape Of You." March 22: ÷ (Divide) was certified gold. March 25: Sheeran topped the Billboard 200 LP chart for 2 weeks, Digital Sales chart for 2 weeks, and Album Sales chart for 1 week with ÷ (Divide). May 1: ÷ (Divide) was certified platinum. May 6: Sheeran topped the Billboard Adult Contemporary chart for 24 weeks with "Shape Of You." June 17: Sheeran hit the Top 10 with "Castle On The Hill." July 16: Sheeran could be seen in the HBO series Game Of Thrones in the episode 'Dragonstone'. August 27: Sheeran won a MTV Video Music Award for Artist of the Year. The video for "Shape Of You" was nominated for a for Best Pop Video and the video for "Castle On The Hill" was nominated for Best Cinematography. August 31: ÷ (Divide) was certified 2x platinum. September 30: Sheeran hit the ARC Weekly Top 40 with "Perfect." November 10: Sheeran could be heard on the Taylor Swift LP, reputation, on the track "End Game." November 11: Sheeran hit the Top 10 with "Perfect." November 19: Sheeran was nominated for 5 American Music Awards including Artist of the Year, Favorite Pop/Rock Male Artist, Favorite Song - Pop/Rock ("Shape Of You"), Video of the Year ("Shape Of You"), and Favorite Adult Contemporary Artist. November 25: Sheeran hit the ARC Weekly Top 40 helping out Taylor Swift and Future with "End Game." December 14: Sheeran topped the UK singles chart with "Perfect." December 15: Sheeran could be heard on the Eminem LP Revival on the track "River." December 16: Sheeran topped the Billboard Digital Songs chart for 8 weeks with "Perfect." December 23: Sheeran topped the Billboard Hot 100 chart for 6 weeks with "Perfect" (helped by a re-recording with Beyoncé). December 30: Sheeran hit the ARC Weekly Top 40 helping out Eminem with "River." December 31: Sheeran topped the Top Pop Songs of 2017 chart with "Shape Of You." December 31: Sheeran topped the Billboard 2017 Year-End Chart Toppers as the Top Overall Artist, Top Overall Artist - Male, Top Hot 100 Artist, Top Hot 100 Artist - Male, Top Radio Songs Artist, Top Pop Songs Artist, Top Digital Song Sales Artist, and Top Adult Pop Songs Artist, and with the Top Hot 100 Song, Top Radio Song, Top Pop Song, Top Adult Pop Song, Top Dance Club Song, and Top Dance/Mix Show Song ("Shape Of You"), and Top Digital Album (÷ (Divide)). January 3: Sheeran topped the Billboard R&B/Hip-Hop Digital Songs chart for 1 week helping out Eminem with "River." January 6: Sheeran hit #1 for 8 weeks on the ARC Weekly Top 40 with "Perfect." January 13: Sheeran hit the Top 10 helping out Taylor Swift and Future with "End Game." January 13: Sheeran topped the Billboard Radio Songs chart for 9 weeks with "Perfect." January 20: Sheeran topped the Billboard Pop Songs chart for 3 weeks and Adult Pop Songs chart for 9 weeks with "Perfect." January 25: Sheeran topped the UK singles chart helping out Eminem with "River." January 28: Sheeran won 2 Grammy Awards for Best Pop Solo Performance ("Shape Of You") and Best Pop Vocal Album (÷ (Divide)). February 24: Sheeran topped the Billboard Adult Contemporary chart for 22 weeks with "Perfect." March 12: ÷ (Divide) was certified 3x platinum. April 6: Sheeran could be heard on the tribute compilation Restoration: Reminagining The Songs Of Elton John And Bernie Taupin on the track "Candle In The Wind." August 20: The video for "Perfect" was nominated for 3 MTV Video Music Awards for Song of the Year, Best Pop Video, and Best Direction. The video for "River" was nominated for Best Cinematography. September 11: ÷ (Divide) was certified 4x platinum. Tracks: "The A Team" - "Drunk" - "U.N.I." - Grade 8" - "Wake Me Up" - "Small Bump" - "This" - "The City" - "Lego House" - You Need Me, I Don't Need You" - "Kiss Me" - "Give Me Love" - "The Parting Glass"
Tracks: "One" - "I'm A Mess" - "Sing" - "Don't" - "Nina" - "Photograph" - "Bloodstream" - "Tenerife Sea" - "Runaway" - "The Man" - Thinking Out Loud" - "Afire Love"
Special Edition also includes: "Take It Back" - "Shirtsleeves" - "Even My Dad Does Sometimes" - "I See Fire" - "All Of The Stars"
Tracks: "Eraser" - "Castle On The Hill" - "Dive" - "Shape Of You" - "Perfect" - "Galaway GIrl" - "Happier" - "New Man" - "Hearts Don't Break Around Here" - "What Do I Know?" - "How Would You Feel (Paean)" - "Supermarket Flowers" - "Barcelona" - "Bibia Be Ye Ye" - "Nancy Mulligan" - "Save Myself"
Note: Song title and position links lead you to the song's ARC Weekly Top 40 chart run, LP links take you to Amazon.com for that LP's info (often including track listings and track samples), and single cover art takes you to Amazon.com for that CD single (if available). Songs charting prior to 1980 have information from Billboard magazine.